Living spaces for many of us are becoming smaller. We are often facing the same problem: how to utilize a small space and make it functional and pleasant. If you wish for a big room but live in a small apartment in the city, you don’t have to give up your dreams. There are tips and tricks to make a small space appear larger by taking advantage of corner space in your home or mirrors. Here are some life hacks for living large in small spaces. Some of them make use of the tiny space behind your doors for hanging towels, some of them store trash bags on a roll in under-the-sink space, while others Use mirrors to add depth and double the living space. With a few simple tricks and creativity, your tiny loft space can surely be transformed to feel like a large majestic home! Gain extra table space without taking up any room by building a narrow sofa table like this one to place behind your couch! Perfect and convenient place for setting a drink down or placing other decorations. Full tutorial via Always Never Done. 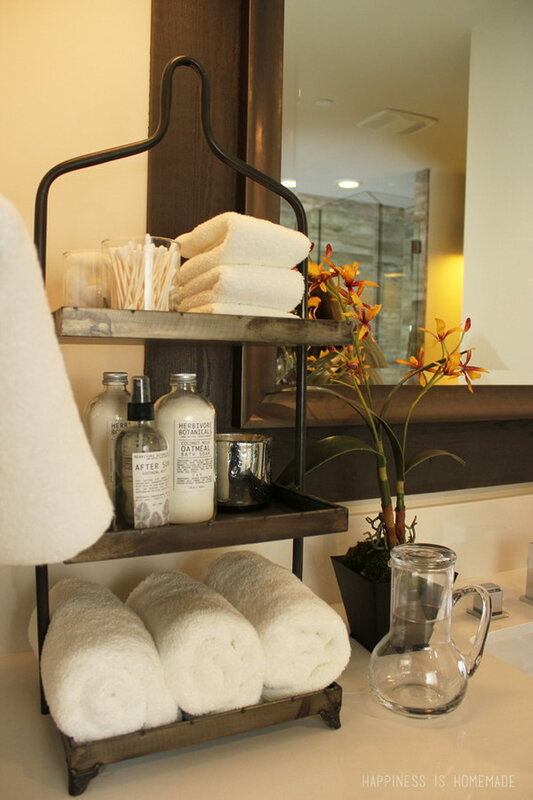 Create a bathroom storage case behind the mirror to hold all the goodies you need. source. When living in a small house, even finding a place for the broom can be challenging. 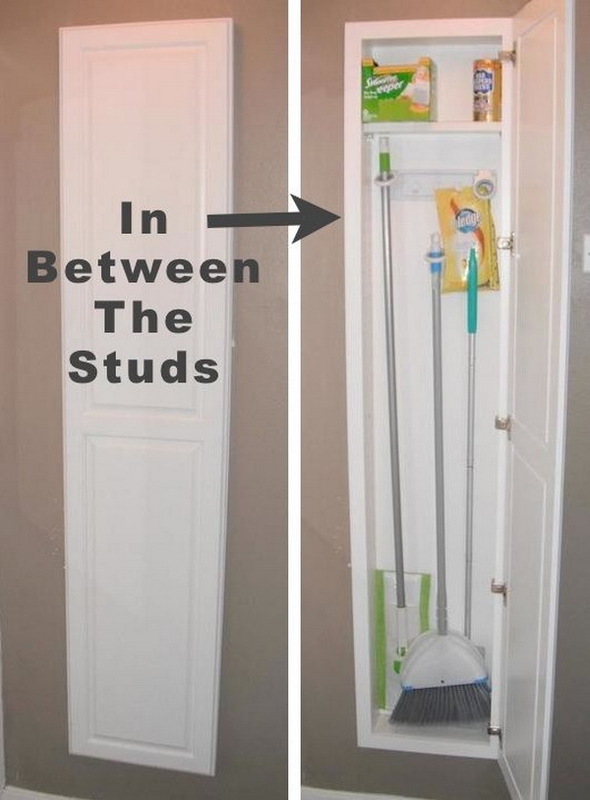 You can use the the wall space in between the studs to make a cabinet for your cleaning tools. It also allows a look that is clutter-free. source. 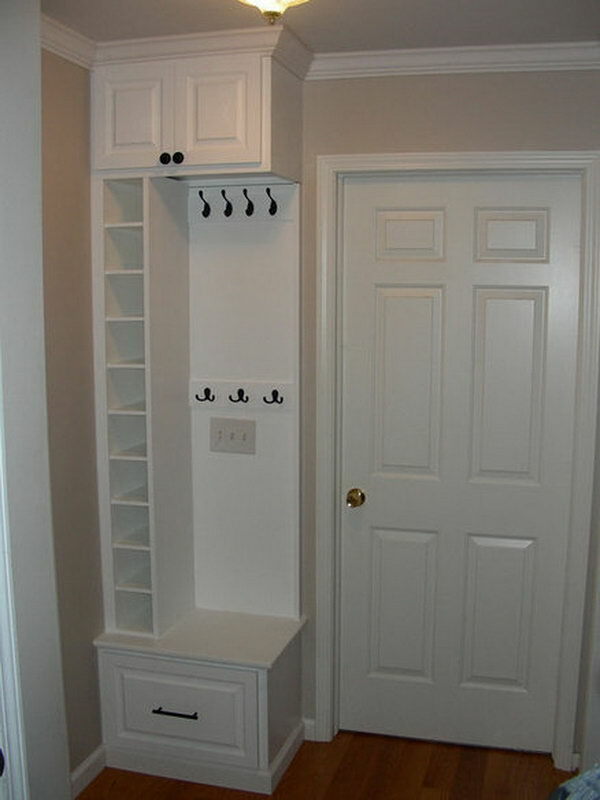 Install shelving in any corner of your home. 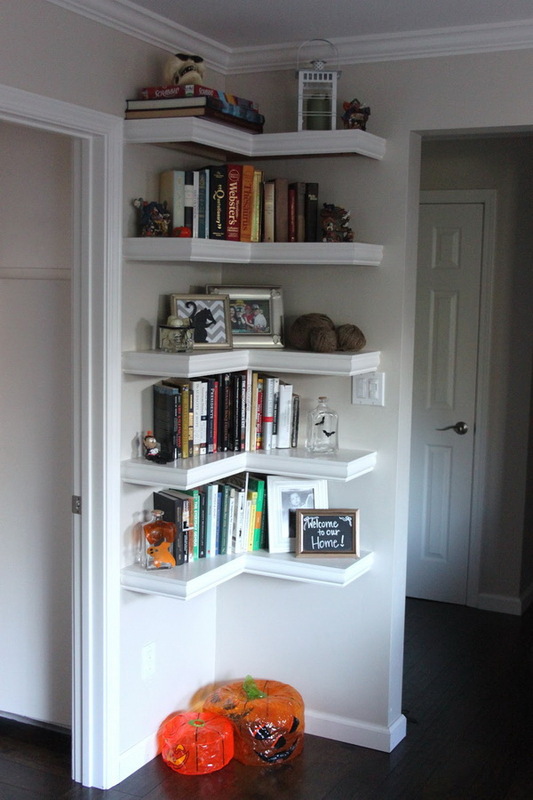 This method allows you to create extra storage while showcasing your great taste in literature. source. 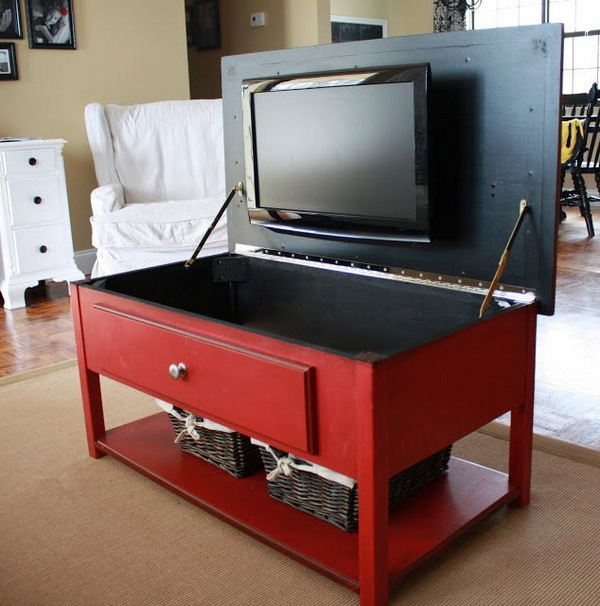 Have that special TV you need to safely hide away in a coffee table. Super tidy idea! source. 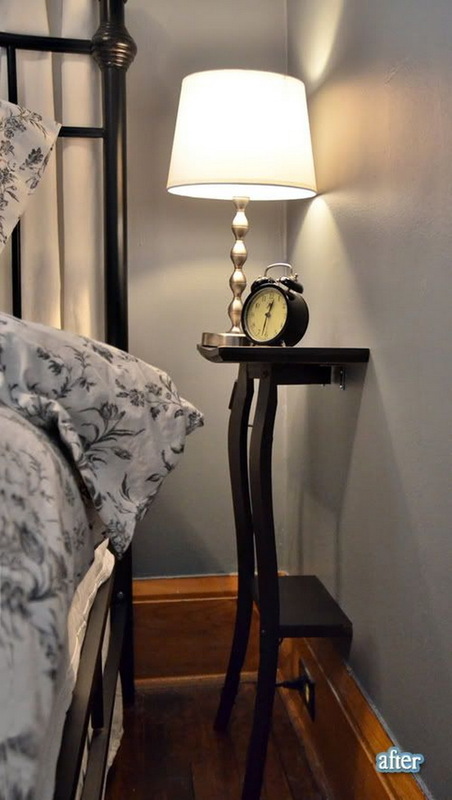 Take 1 table, cut it in half and attached each piece to the wall as night stand! source. 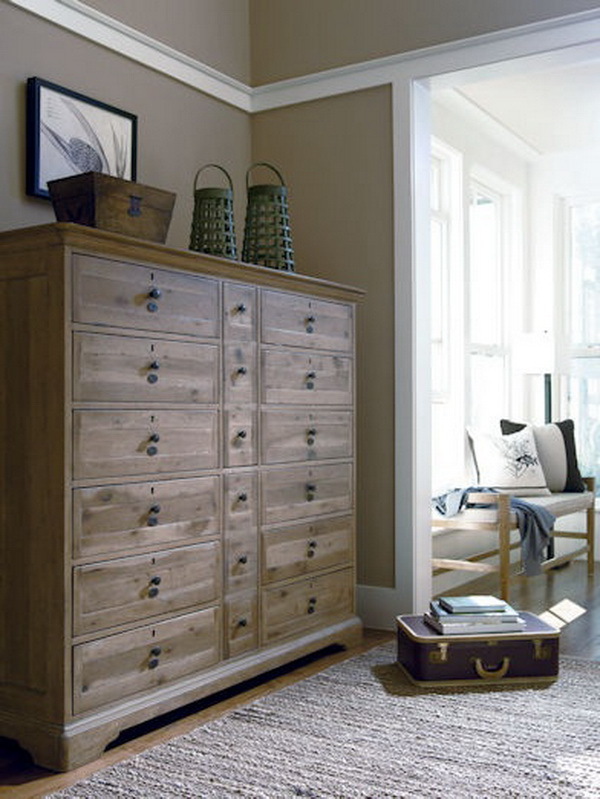 Love this gorgeous dresser for storage! source. Talk about teeny. The space is so tiny but is so well planned. It has everything you need, white cabinets, plenty of hooks to hang up your coat. Awesome and inspiring. source. Make full use of the tiny space behind your doors. 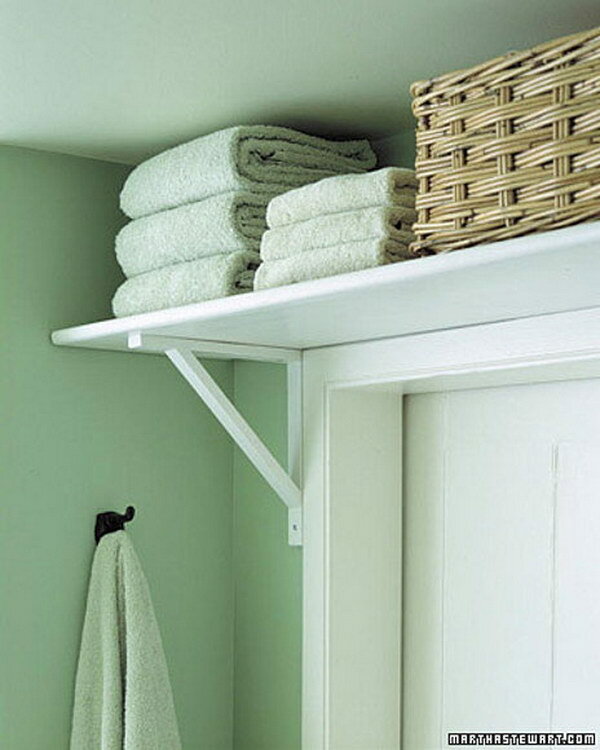 It’s perfect for hanging towels with two behing-the-door towel rods without taking up any of the space on your walls. 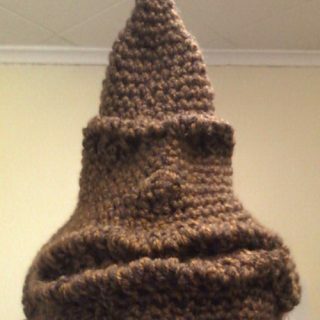 Check out the full instructions for this project via Jenna Burger. 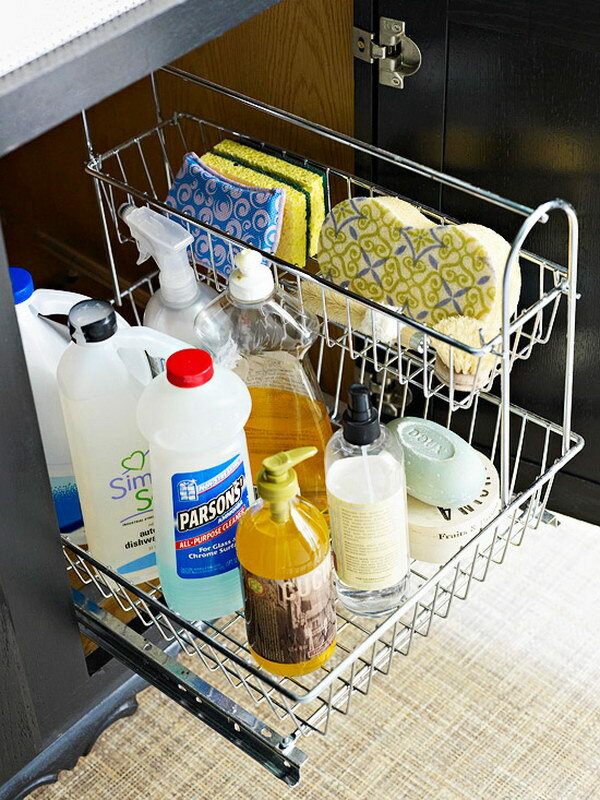 Install a shelf above your bathroom door for the extra storage and easy reach for your bathroom supplies anytime you need them. See the details via Martha Stewart. 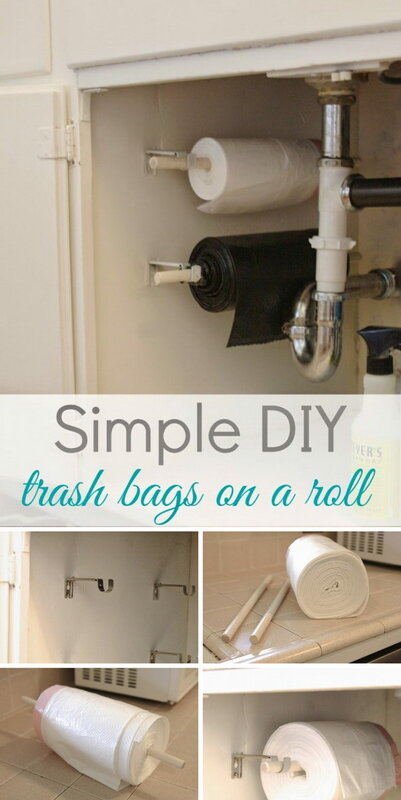 Store your trash bags on a roll to maximize your under-the-sink space. 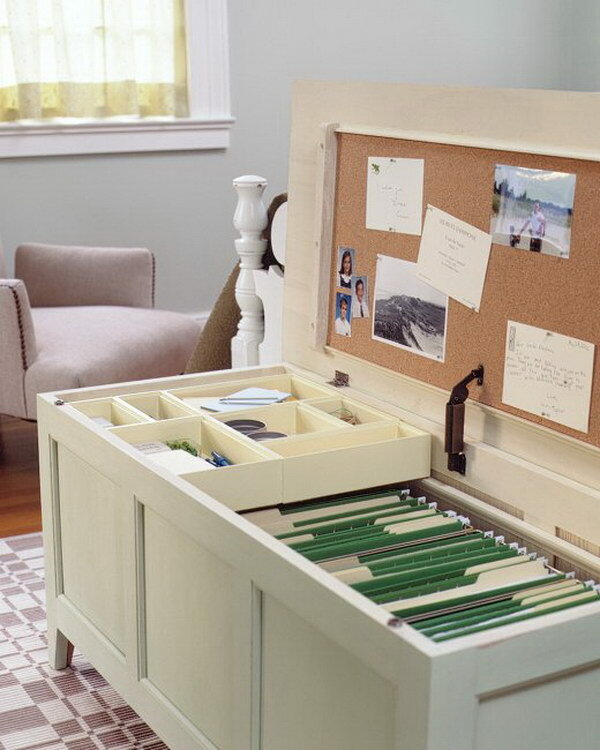 Check out the details via Simply Organized. Use your backsplash as storage for coffee can, sugar, butter, salt & pepper, cork screw, etc, and keep your counter free in the kitchen. Go to check out the DIY details via No 29 Design. 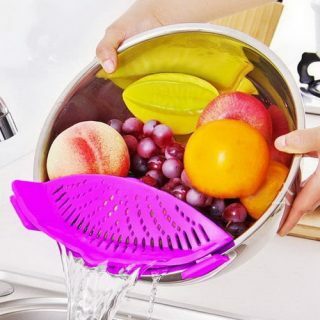 Making use of the space of under the sink can be a little tricky. 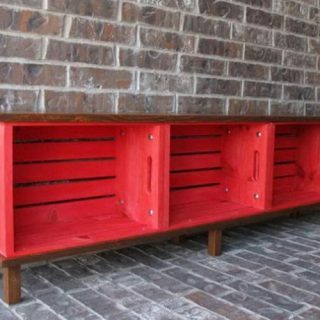 Check out for full instructions of this DIY project via BHG. Another ingenious way to save the space in the kitchen with this DIY rolling pantry! 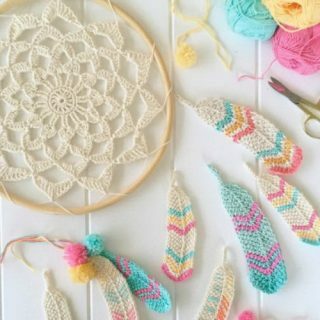 Step-by-step tutorial via diy passion. A computer desk that you can pull out with some extra cabinet space. Such a cheap and easy DIY project that looks so stylish too! Get the tutorial via shanty-2-chic. 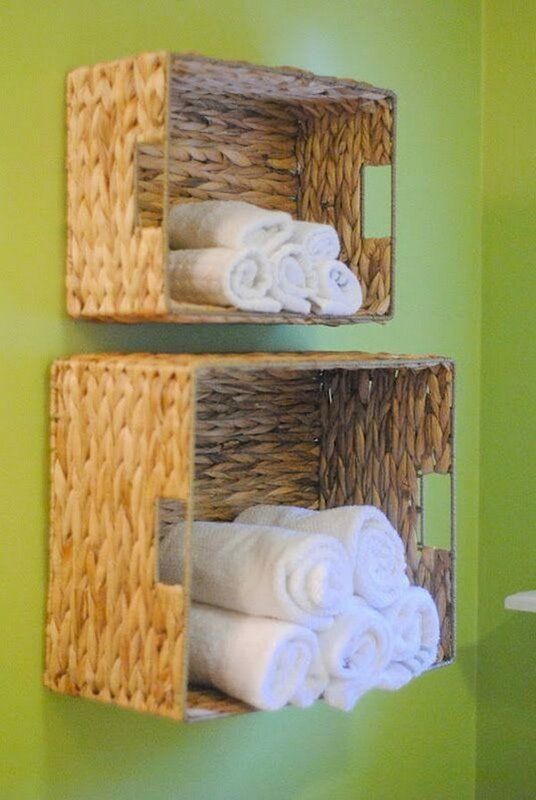 Instead of storing towels under the dirty sink, you can consider using an easy and lightweight baskets on the wall to store your towels. See more details and DIY instructions via Making Lemonade Blog. 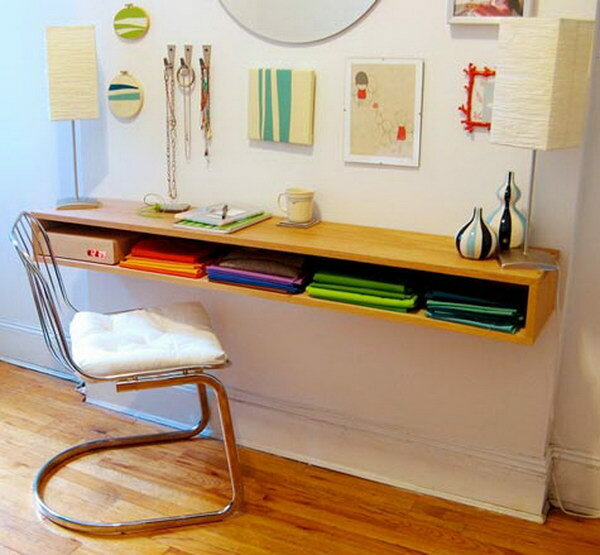 This stunning hanging desk is a great space saver. You can make just with few boards at home. Super cheap and easy DIY desk! Follow the step-by-step tutorial via Design Sponge. Create one pull-out counter top with IKEA hacks for more kitchen storage. See the instructions via ikea hackers. 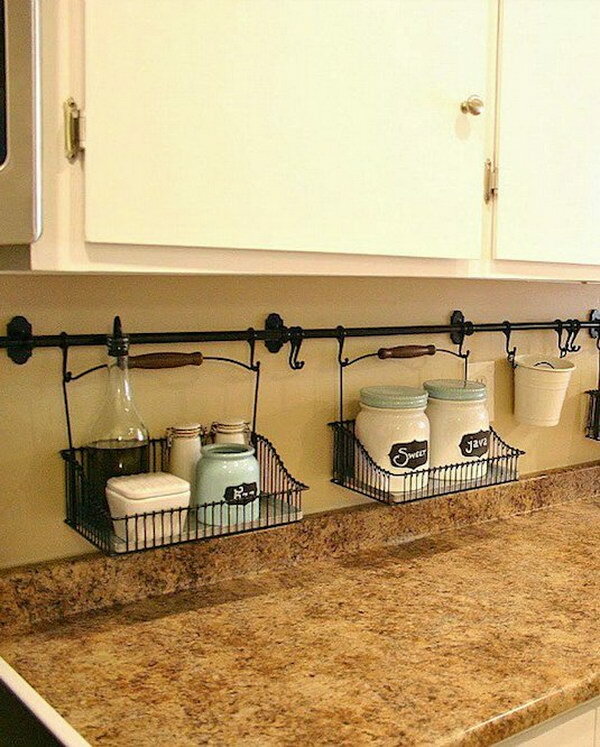 Hide your ugly trash can and aslo gain extra storage in the kitchen with this brilliant fix abd DIY kitchen design. See the tutorial via bydawnnicole. Have the versatility of a wall with these sliding wall partition. You can simply slide it open to create a larger, open space for entertaining when you want. See more via famurat builders. Super simple and cheap space saving idea for your inspiration! 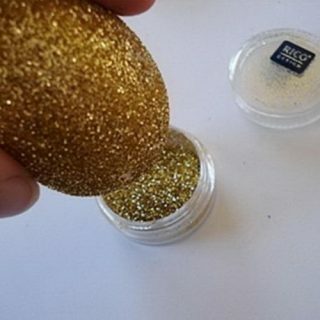 See the DIY tutorial via simplydiy2.blogspot. DIY Catch-All Shelf. 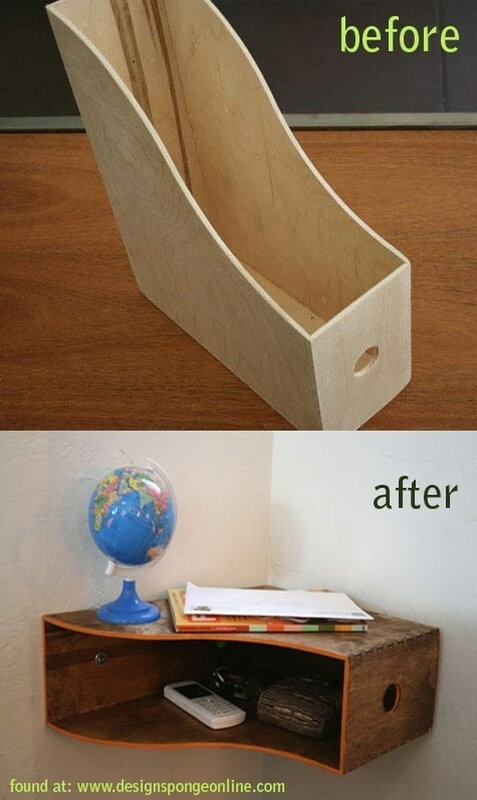 Create a corner shelf of any room for paper storage out of a magazine rack. See the easy full project and instructions via Design Sponge. Use every corner of space in your home! 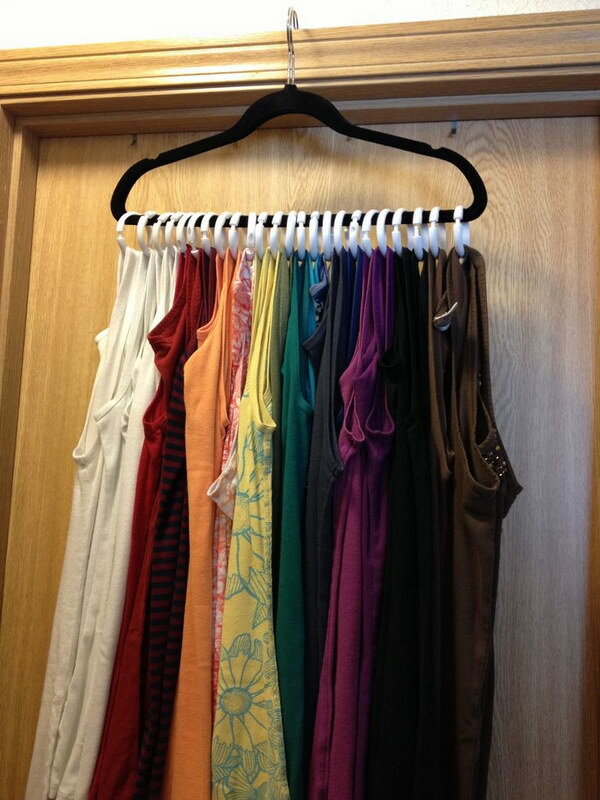 Here is a DIY corner closet to hang your clothes. See the DIY instructions via Mint Love Social Club. 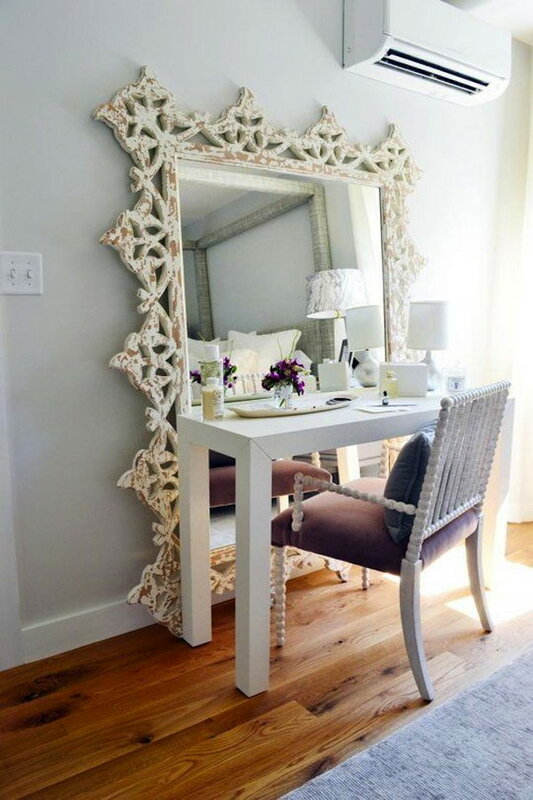 Mirrors are great for “doubling” your space. Genius and simple idea for small space living! source. 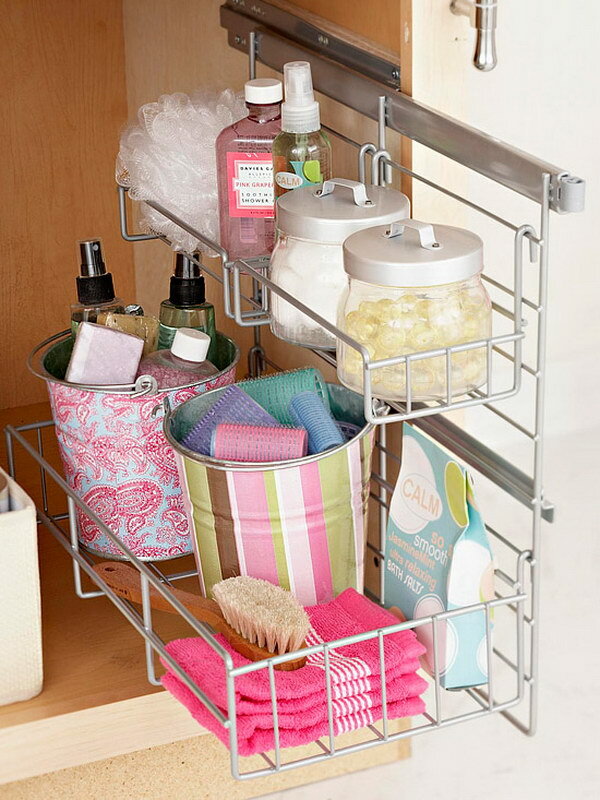 Space-saving laundry rack to be placed on the wall at the head of the tub/shower. 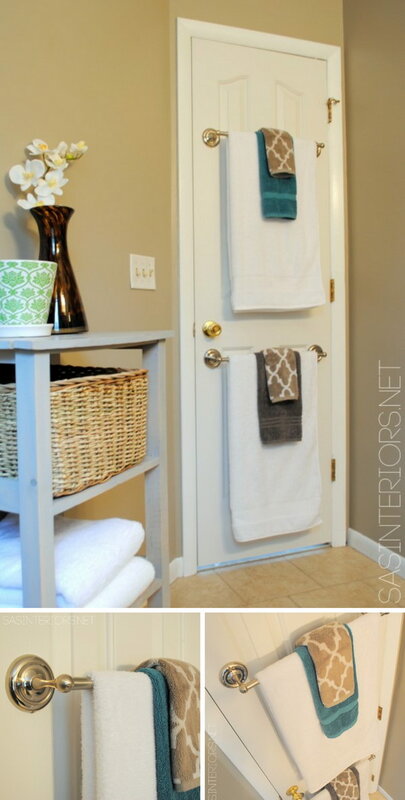 This DIY laundry room drying rack is perfect for a small laundry. You can easily fold it when you don’t need it without taking extra space. 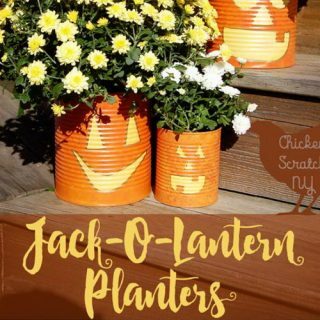 Follow the tutorial via cent sational girl. DIY pull down table as a super space saver. This would be great in a small kitchen or a playroom for kids. See more details via life hacker. 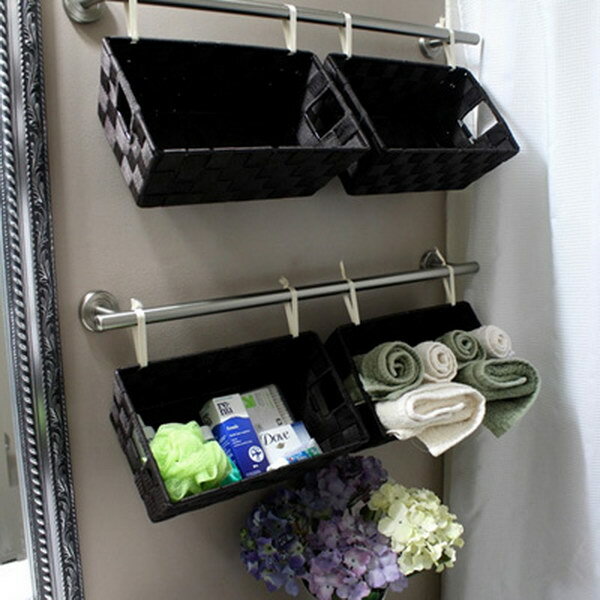 With just a few shower curtains rings and a velvet hanger, you can store those bad boys all on ONE hanger. 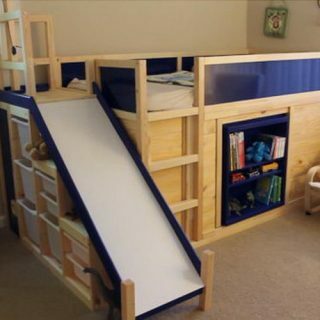 Genius idea for space saving in the small bedroom. source. 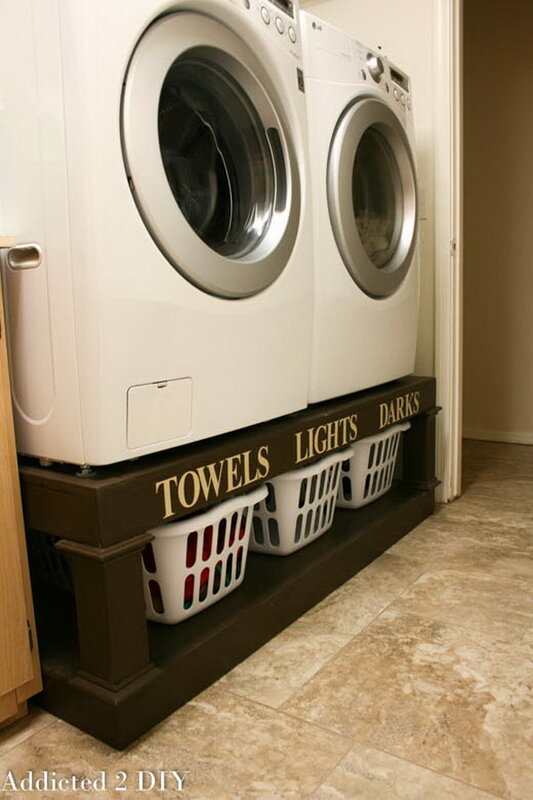 These DIY laundry pedestal are so functional in your laundry room. Easy to make at home with the tutorial via addicted 2 diy. 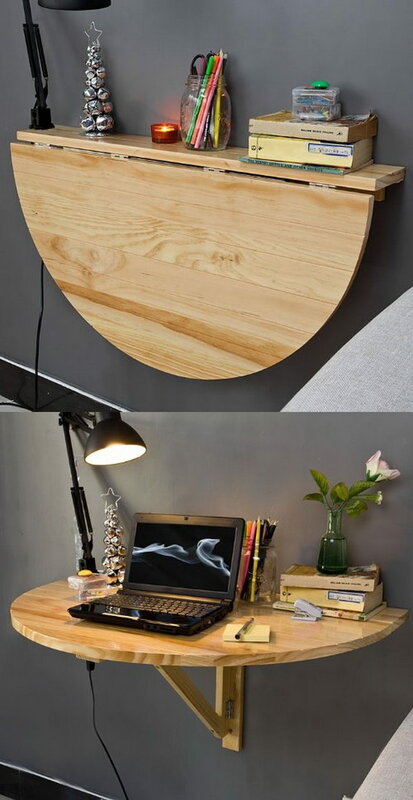 Another space saver furniture design with this semi-circular wall table for convenient extra working or dining place. You can also fold it away when not needed! source. 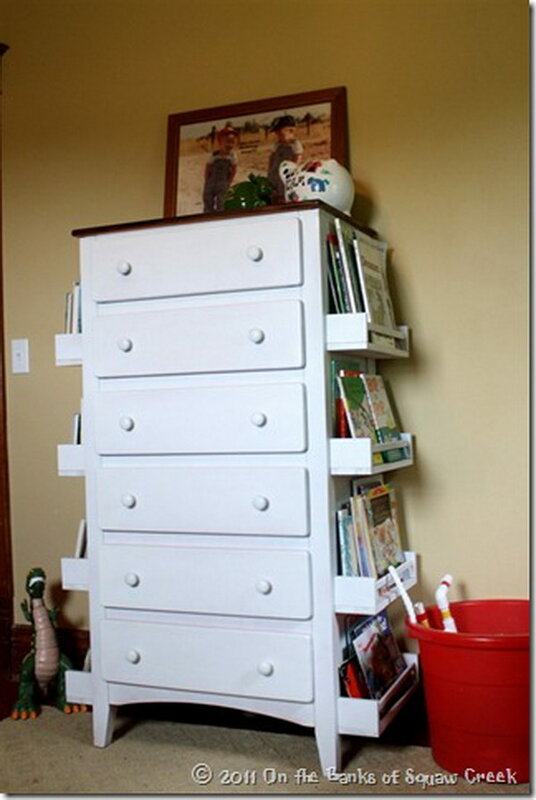 Attach spice racks to sides of dresser to store children’s books. See the DIY details via on the banks of squaw creek. 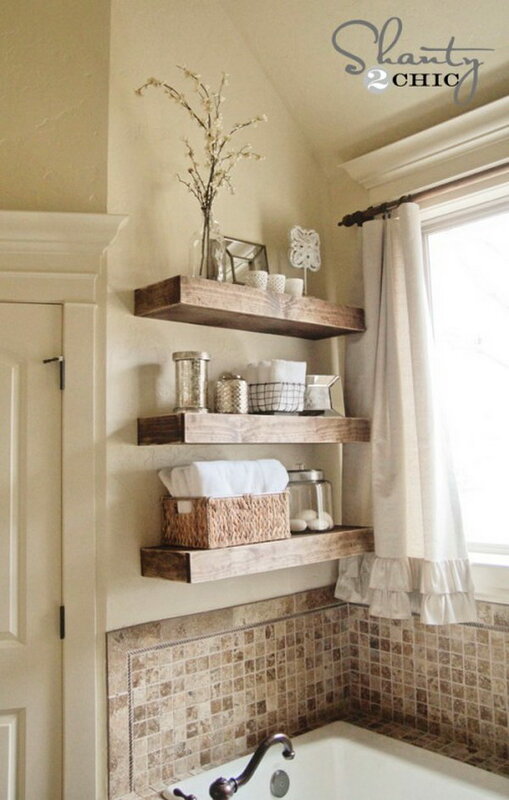 These wooden shelves are perfect to store the bathroom items without taking any extra space in a small bathroom. 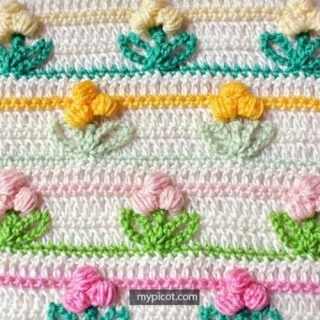 See details and tutorial via shanty-2-chic. Consider a tiered tray to hold all of the essentials without taking up as much room on the counter for small bathroom or kitchen counters. 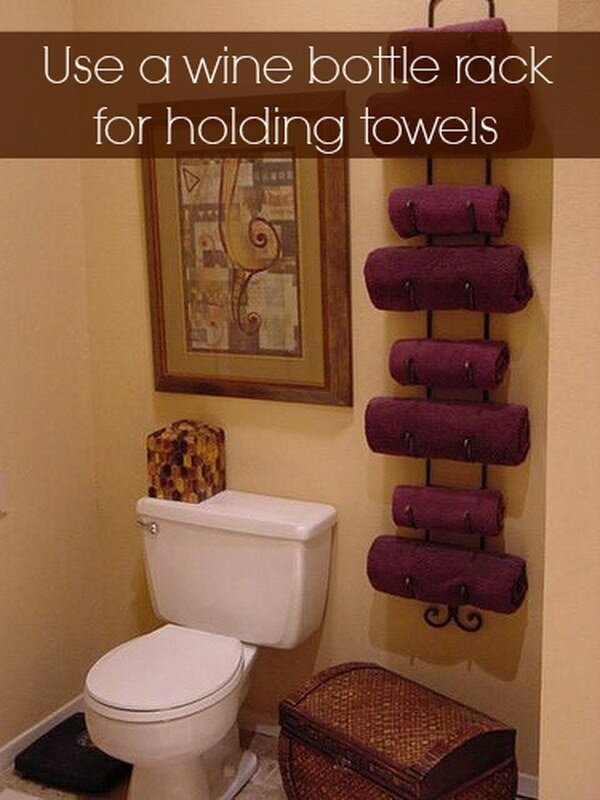 Simple and cheap space saver. source. Another genius and creative way to take advantage of the wall space. 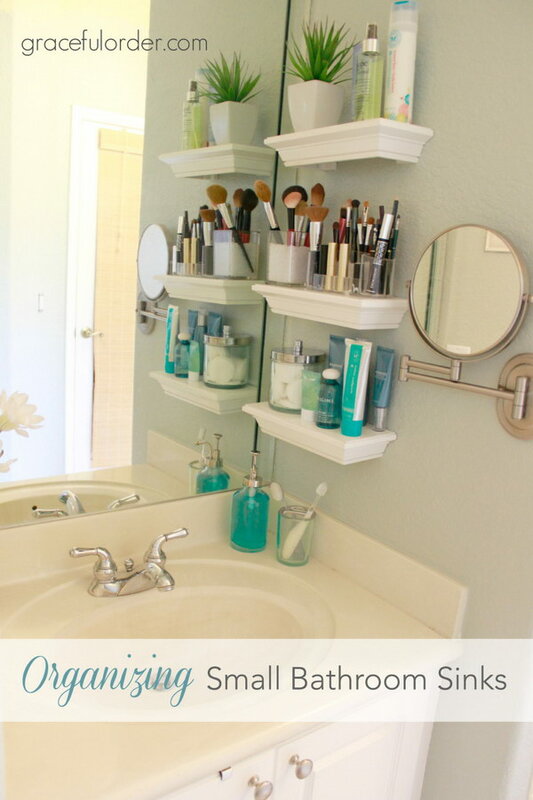 Design floating shelves next to your vanity for all of the items you use often. See the details and instructions via gracefulorder. 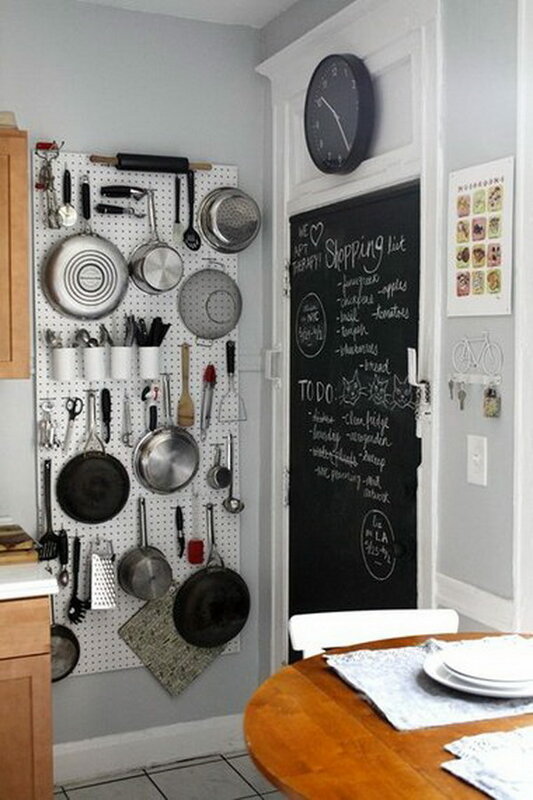 Hang pots and pans from a vertical pegboard for space saving. 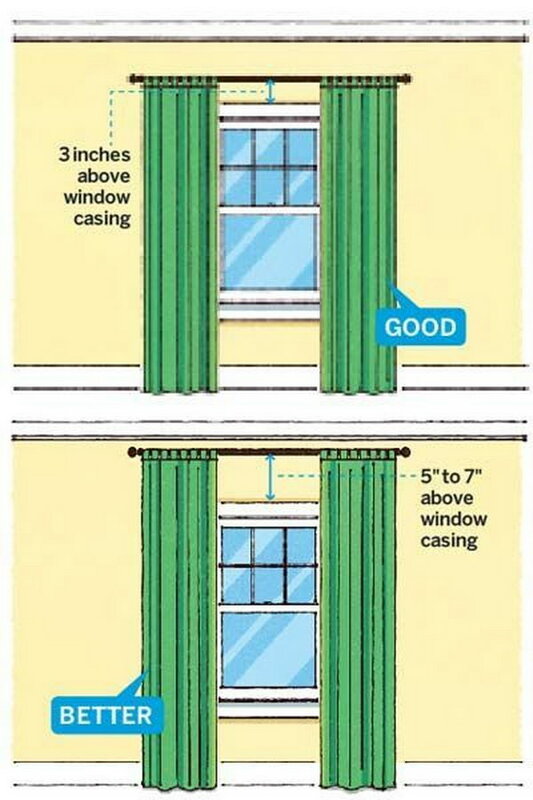 See details via Apartment Therapy. This mini office chest is perfect for storing your files and little office goodies in small spaces. It also doubles as extra seating when closed. See the DIY instructions via marthastewart. This hanging chair would provide enough space for drying clothes and a little extra storage shelf in your laundry room. Happy to meet this hack. Get more details via yiconglu. An easy and budget-friendly way to keep all of your flip flops organized and off the floor with a wire cutter and pair of pliers! Tutorial via epbot. It’s an amazing life hack for space saving. source.